Throwing money at a problem isn’t always the solution. But if you need to find and keep long-haul truck drivers in today’s competitive job market, how much to increase their pay — in one form or another — has to be a key tactical consideration. 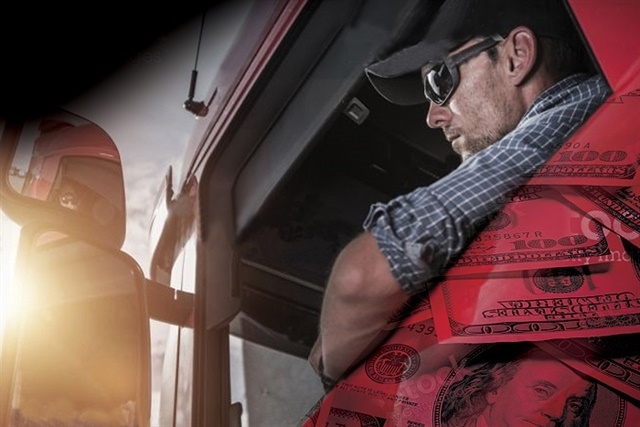 Boosting driver pay has long been avoided or at least downplayed by many long-haul fleets bedeviled by the twin demons of a driver shortage and high turnover — not surprising, as no business ever finds it easy to roll back pay hikes. Hence many fleets have done everything but outright increase pay to recruit and retain drivers. Instead, these operations have focused more on providing new equipment spec’ed for driver comfort; implementing as many driver-friendly operational tweaks as possible, such as promising “no-touch freight” and more time at home, and offering generous healthcare and retirement benefits. 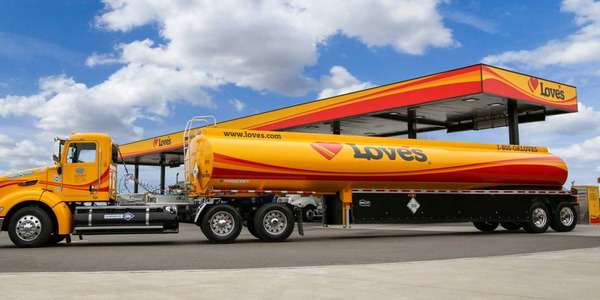 These fleets may have also upped pay, but typically only through various incentive and bonus offerings, rather than dishing out straight-up increases in mileage-based or hourly pay rates. But those approaches are increasingly seen as not good enough. Not with a U.S. economy that is by nearly all measures booming, after having escaped the doldrums that constrained it after the Great Recession. Now, the country’s reinvigorated economic engine is forcefully impacting the driver market with a one-two punch: Just when there are more desirable job opportunities available in years for high school graduates, demand for drivers is being driven up and up by a sizzling freight market. Peer closely at trucking and the picture looks even bleaker. 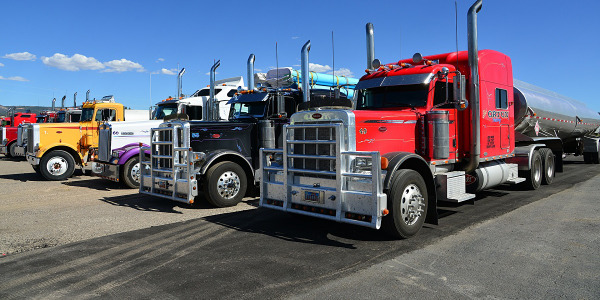 According to the American Trucking Associations, the turnover rate at large truckload fleets rose five full percentage points in the third quarter of last year. That equals an annualized rate of 95%, the highest churn recorded since the end of 2015. The overall driver shortage isn’t any more encouraging. In October, ATA released its latest update, estimating the shortage would climb above 50,000 drivers by the end of 2017 and, if current trends holds, to over 174,000 by 2026. So don’t expect that raising driver pay will be a short-term phenomenon for long-haul fleets. 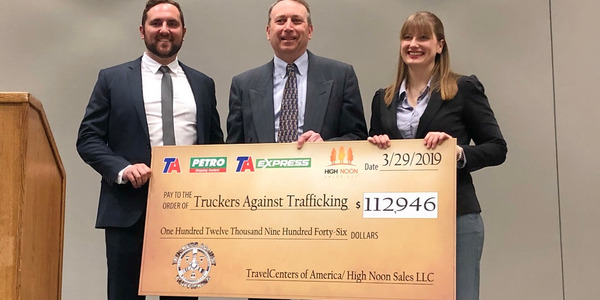 According to Gordon Klemp, president and CEO of the National Transportation Institute, which tracks driver wage trends across all trucking segments, the pay of a unionized truck driver in 1979 would be the equivalent of $101,600 in 2016. Yet NTI data shows a similar driver in 2016 earned just $52,406. Klemp made that telling point in a November conference call hosted by Stifel Capital Markets. He and NTI COO Leah Shaver explained that economic and demographic trends coupled with the rising tide of freight will sharply push up driver pay and benefits. She said pay increases for drivers are now averaging 1 to 2 cents per mile, but in some cases, pay hikes are heading up into the range of 4 to 7 cents per mile. “Changes in pay are weighted to region and experience now. It’s no longer one or the other.” Shaver also explained that fleets are offering referral bonuses more often. These can net a driver $3,000 or more just for referring an applicant, plus extra mileage pay for three months to a year. Yet another negative is that trucker pay largely has not kept pace with inflation. He said that from 2006 to 2017, net growth in for-hire truck driver income was a “very low” 6.3%. During that same time, pay for private fleet drivers rose 16.5%, which compares favorably to the inflation rate of 18.5%. Also during that same time, minimum wage climbed 45.6%, and companies such as McDonald’s hiked hourly pay a whopping 94%. “That puts driver pay in perspective,” Klemp said. “It’s become less attractive over time, putting a real damper on growing the driver pool over the years.” And now with a superheated freight market, the only place driver pay can go is up. All the signs are there for the reading. Klemp said GDP growth remains in the 3% range and as a result, “blue collar jobs are going unfulfilled in many employment sectors.” He noted that housing build times are “stretching out by months due to the labor shortage,” and hourly rates for laborers and semi-skilled workers are increasing rapidly. Little wonder, then, that NTI projects driver wages will continue increasing into this year. 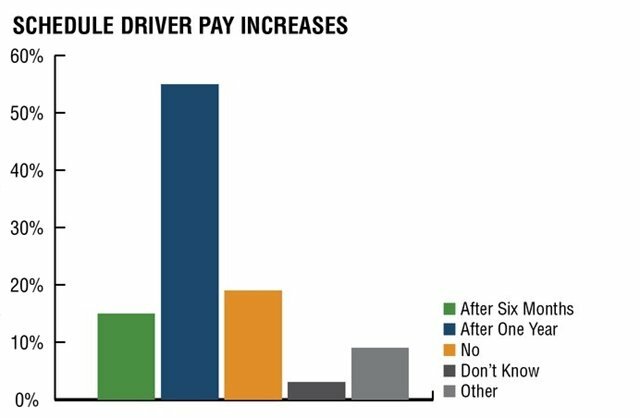 A study conducted by WorkHound, which provides fleets with actionable insights on driver retention, found that drivers not only want to be paid well, but also are very concerned about the confusing and uncertain aspects of getting paid. Not surprisingly, for example, they get turned off when carriers calculate their pay based on household goods or practical miles vs. the actual, physical miles the driver tracked. “A lot of people expect drivers to complain about wanting more money,” observed Max Farrell, WorkHound co-founder and CEO, during a recent Stifel Equity Research conference call. “But one of the biggest challenges is how drivers are paid. [They] often have to fight for their correct pay weekly. 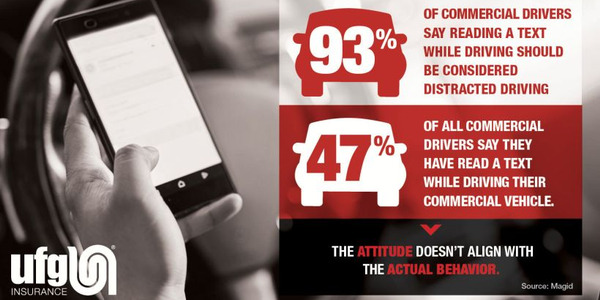 Office staff doesn’t don’t have to deal with this issue, as their salaried pay is predictable and expected” and so they may not grasp how important this is to a driver. According to Farrell, other pay issues managers should be well versed in include how reimbursements are handled, confusion over different payroll systems, and explaining complex formulas for detention pay and toll and scale reimbursements. Yet another potential pitfall that can send drivers packing is how frequently pay is raised. A study by ERE Media, which offers services to professional recruiters, found that looking across all industries, 35% of new employees would look to switch jobs if they did not receive a raise within 12 months. 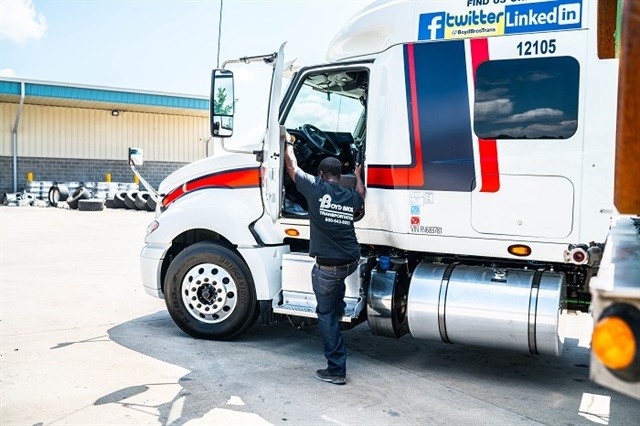 By comparison, Driver iQ, which provides employment screening of truckers, found that 70% of its fleet customers schedule a pay raise within the first year, while others set them for sometime within the first three to six months. Some of the carriers make a distinction based on driver experience when determining pay increases, while others factor in DOT violations. 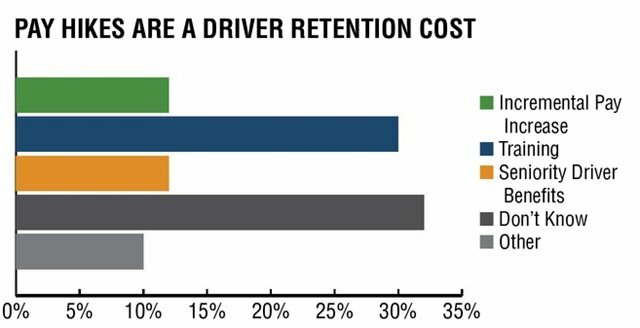 Driver iQ also points out that truckload fleets have historically limited their estimates of the costs of driver turnover to just recruiting costs, leaving out retention costs. But respondents to a survey indicated that their retention costs included incremental pay increases, training, and seniority benefits. And included in “other” were both the cost of recognition awards and of delayed sign-on bonuses, which of course are another form of driver pay. Certainly, the biggest challenge for a given long-haul fleet is figuring out how much to raise pay and in which manner to do so to both help find and keep drivers. Also worth pondering, especially when recruiting, is whether to stress other elements of total compensation— such as company-paid healthcare, life insurance, retirement accounts, and other “fringe” but valuable benefits — or strictly sell on pay per mile and potential cash bonuses. Boyd Bros. is one of several flatbed haulers that’s now offering a weekly minimum pay guarantee. Chris Cooper, president, says the idea is to provide “baseline [pay] that adds predictability to a driver’s life.” Photo: Boyd Bros.
To be sure, there is a lot of room to be creative. Consider the tack just taken by Joplin, Missouri-based CFI. 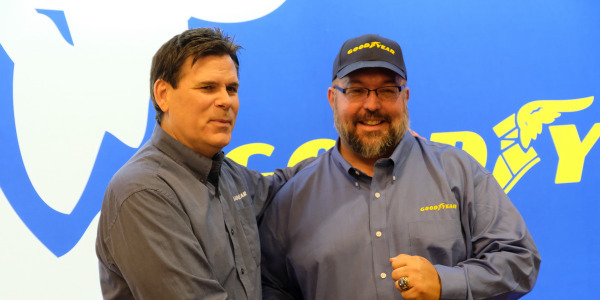 In late November, the truckload carrier launched what it calls an Experienced Driver pay package that aims to “pay current and future drivers for their professional, over-the-road truck driving experience” on top of the 2-cent-per-mile solo and 5-cent-per-mile team increases the company announced early last year. The distinguishing feature of the program is that it compresses the years it takes for a driver to reach top pay, explains CFI Vice President of Human Resources Bert Johnson. Under the plan, a driver with one year of experience starts at 40 cents per mile, while an experienced driver receives an additional 1 cent to 5 cents per mile, depending on their specific experience. He notes this is all in addition to the driver benefiting from CFI’s “robust” benefits package. Johnson says the genesis of the experienced driver offering traces back to CFI’s own experience selling its compensation package to prospective drivers. 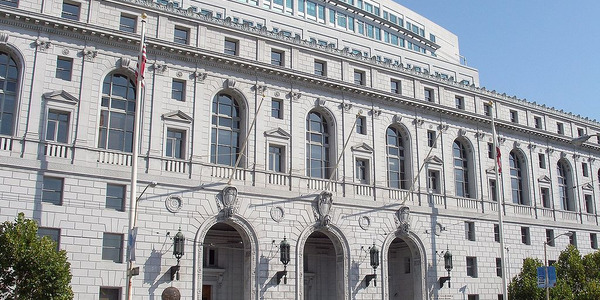 “We found that when we spoke of total compensation and ‘average pay,’ it worked to a certain extent. But drivers weren’t so interested in the total package, benefits and all, when they were ‘shopping’ among carriers” for the highest pay. Yet, he adds, “we must still provide healthcare and 401k benefits, as well as high-quality equipment and safety bonuses” to stay competitive. It’s just that those factors are not what pulls them in the door. “We started looking at it more closely and found that 53% of our drivers had less than one year of experience, including those from our student-driver program, and that the other 47% felt they were not being rewarded for their experience,” says Johnson. “And with freight capacity driving up the shortage, we needed to reach out further. Johnson says any pay scheme has to be a work in progress. “You constantly have to look at it, especially with the looming driver shortage. What are your demographics and what can you tweak? And it’s important to be transparent with drivers — especially about their pay. We work very hard to build trust with our drivers.” That effort appears to be paying off. CFI’s driving force consists of some 2,000 company drivers along with about 500 owner-operators, and Johnson says that as of November, turnover stood at 77%, well below ATA’s reported national average. Another innovative approach is to offer some form of weekly guaranteed pay, which helps address some of the concerns about the irregular nature of driver pay that tends to concern younger drivers and spouses who want to stick to a routine bill-paying regimen. The idea behind a guaranteed weekly minimum is to provide peace of mind for when a driver is not driving due to circumstances beyond his control, such as delays at the customer, traffic congestion, or weather delays. It’s one tactic being used by a number of flatbed/specialized carriers owned by the Daseke Company. Included in a 4-cent-per mile pay increase for company drivers announced in September by Daseke’s Boyd Bros. Transportation is a $900 per week pay guarantee that’s available to company drivers at all levels. 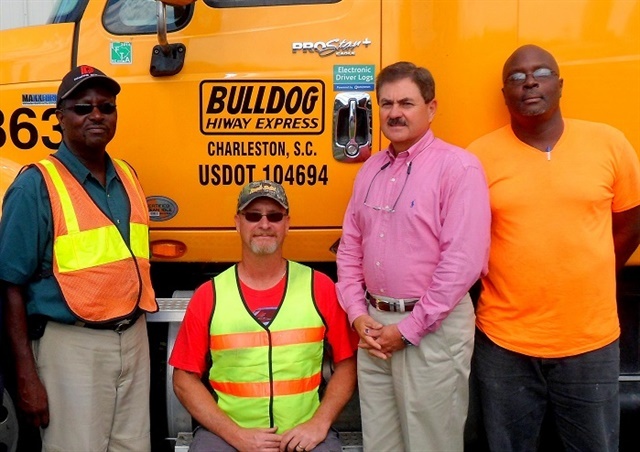 Daseke’s Bulldog Hiway Express is now offering what it calls Salary Plus, a guaranteed minimum weekly of $1,000 for drivers in its open-deck division. As at Boyd Bros., the offering essentially sets a floor, as Bulldog Hiway flatbed drivers typically average $1,300 per week, or more than 60 cents per mile. CEO Phil Byrd explains the thinking behind the Salary Plus branding of the weekly pay guarantee this way: “The ‘salary’ shows they will make a minimum of $1,000, while the ‘plus’ references the many short-haul miles they can run, which maximizes their daily earning potential without taking long trips.” So the package sells pay, predictable pay, and more home time. Convinced the driver shortage will only grow, bulk hauler and logistics firm Kenan Advantage Group is guaranteeing pay increases for the next three years with an eye to significantly boosting driver pay to ensure it can meet freight demand. In other words, fleets are no longer competing just with other fleets for drivers. Now, they’re competing with every industry that needs to pull in blue-collar workers from a rapidly shrinking labor pool. That means it’s time to pay up like never before.